Adaptive control technology offers full automation of configuring control circuits at a wide range of industrial control objects with various latency types and values. It allows giving up legacy methods of identifying object dynamics and calculating optimal loop settings. longer service life of runtime module due to using a two-level test signal. The previous experience shows that adaptive loops generate 15% savings of raw material and power in comparison with manual control or about 5% in comparison with traditional PID loop with a wrong configuration. Moreover, adaptive control decreases the cost of setup works. TRACE MODE SCADA and SOFTLOGIC system offered adaptive control support in 1998 providing function blocks with Techno FBD - visual programming language of IEC 61131-3 standard. PID setting using job jump (RJMP) - block of calculating PI/PID loop based on accumulation and processing of data arrays: values of object input and output. 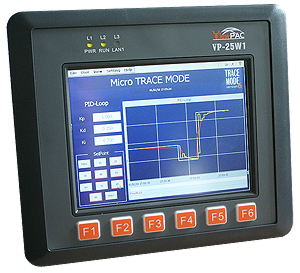 Techno FBD lanuage enables both programming of controllers and operator's stations with TRACE MODE SCADA system. Consequently, optimal loop settings can be calculated both in controller, and on operator's PC (with the following loading into controller), which enables using adaptive control both in sytems based on open, TRACE MODE-programmed controllers and both in traditional PLC-based systems. Adaptive control is available both for constant adjustment of loop settings and periodical and on operator's command . The latter APID and APDD block change even allows not to turn off the process of automatic loop adjustment (for instance, for objects with changing perofrmance or those operating with significant load changes). According to the principle of adaptive loop operation, besides the loop signal, the object input receives a test sinusoidal signal of low amplitude (usually not above of the inherent process noise). The amplitude and phase of the harmonic component in the output are used to calculate the loop settings. By determining the parameters of an amplitude-phase object parameter in the closed circuit, you ensure optimal settings at the loop. TRACE MODE adaptive control provides automatic filtration of the response curve removing accidental agitations and noise. The improved algorithm of approximating a higher level object using the inertial link model at the first level with latency enables taking into account the dynamics of the runtime modules and sensors. Modal loop is a numerical object model and astatic full-level watchdog. The modal loop parameters are calculated using an original methodology without selecting the roots of equation in the closed circuit. The adaptive loop settings are calculated according to the period of the given channel allowing immediate application in control systems. Uneven loop (FZCTR) features uneven loop functions and is usually used in combination with a block of uneven loop configuration (SFZ). For infomation about the TRACE MODE adaptive loops, please use the emulator of Integrated development environment. 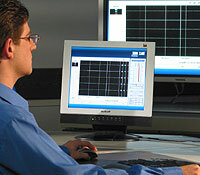 Additionally, please see online Virtual adaptive control laboratory. The laboratory page contains examples of efficiency of the adaptive control algorithms using various types of objects models (your web-browser should also support Java). You can debug the algorithms of adaptive and modal control in Profiler only using professional tool TRACE MODE 6 SCADA system or Real-time monitors with adaptive control support.